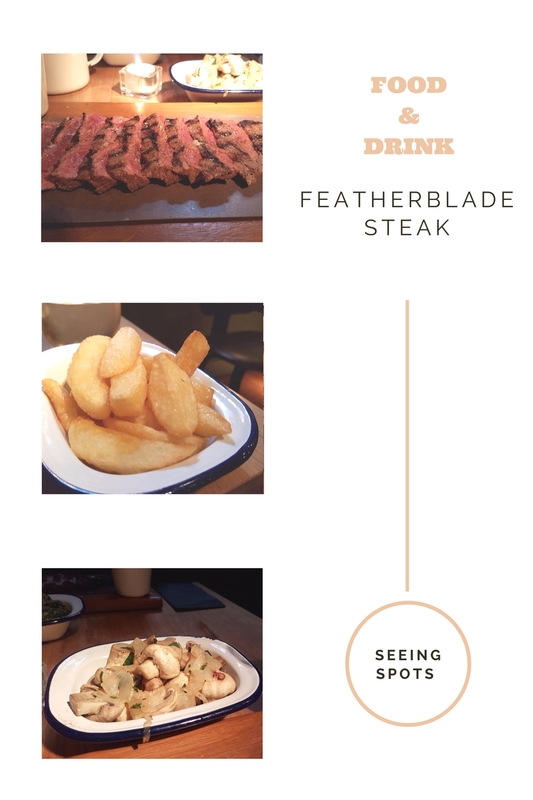 Last week I visited Featherblade Steak which is Just off King Street, on Booth Street in Manchester, with a work friend before we headed to a gin tasting event. More about that in a separate post. 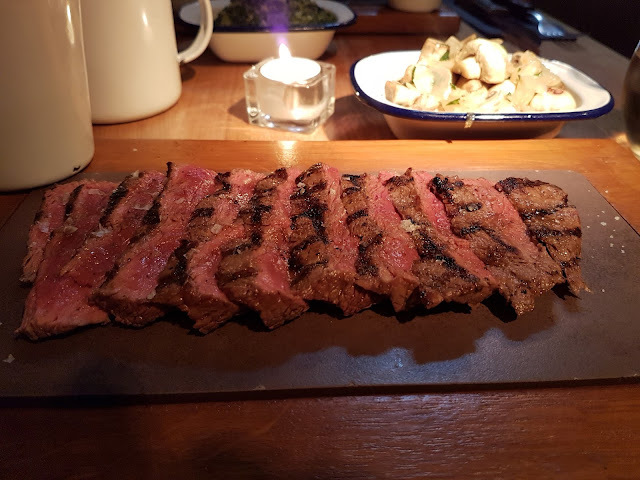 We decided it would be sensible to have something to eat as it was a Tuesday night and in all honesty, we didn't know what to expect at the gin tasting (it was good). Featherblade is a pop-up restaurant and it's selling point is "One cut. One Price. Ten quid"
Salted popcorn comes to the table while you decide and we were offered a choice of specials which my friend says is new, but we'd gone for steak and steak is what we got. 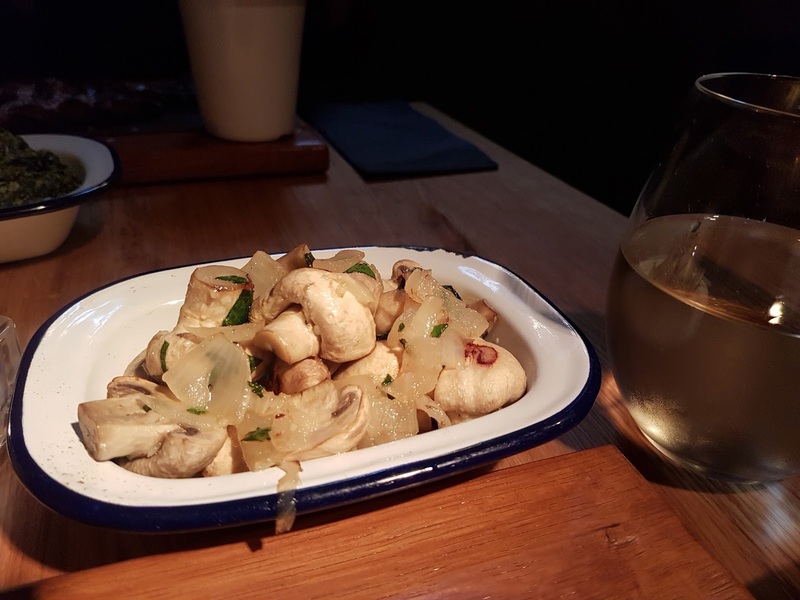 Sides are priced separately and I couldn't resist the mushrooms and onions, for me, it's favourite side dish with steak and I'm a huge fan of mushrooms and who could resist the dripping fried chips. 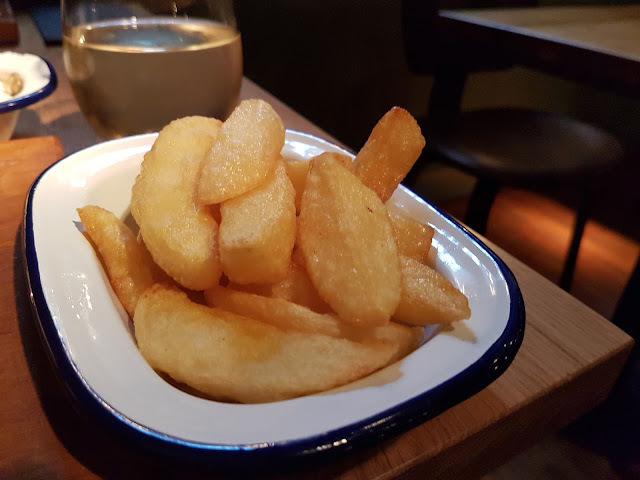 Each cost £3 and they were big enough to share, and by share I mean the other person gets two different side dishes so you get the best of everything. There is also a great selection of beers, wines, soft drinks and cocktails. My wine of choice was the semi-dry Pinot Grigio which was lovely and fresh and I would have happily had a second glass if it wasn't for Gin tasting. While the limited menu choice might not be for everyone, I loved this concept. I get menu blindness when I'm faced with a large number of options and to go somewhere and not have to think about what I'm having or spend days pouring over a menu to find something to have. I'm not fussy (I am a bit) but getting those three choices in case they have run out of options 1 and 2 was eliminated and for that reason, I would recommend this to all my steak loving friends. This post has been a long time coming but I after big events like the Curve Fashion Festival it takes me a long time to process what has happened and I always get a case of post-event blues. There is no denying that it is a long and tiring day but it is worth every emotion, tired moment, ache and pain it causes. This might seem dramatic but every part of my body hurt after the event. Meeting so many people, hugs, walking around, chatting non-stop takes it out of you more than you'd think. Events like these for me are more about the people than the stands. As much as I love to shop, I love meeting up with friends more. I had decided to make a weekend of it, I love Liverpool and staying over Friday and Saturday gave me a chase to explore the city (ok the shops), see my friends, go to the event and recover. One of the things I most wanted to do was to see the street of umbrellas that are part of an Autism Awareness campaign, to be honest, I don't know anything about the campaign itself. I should really google it but I'd watched a piece about them on our local news (Which also covers Merseyside as well as where I live) and wanted to see them for myself. They are beautiful to see and what I hadn't realised was they have been decorated as well as displayed. If you want to see them they are on the street at the side of Primark. Any trip to Liverpool isn't really a trip if you don't go to P&D Deli. This is one of my favourite spots in the city. It's down a side street (next to M&S) and they have outside seat with heaters and an awning to protect us from any inclement weather. Initially, I had booked to stay in a hotel but when I decided to stay over for longer I changed my plans and booked an Air BnB. This was the right decision, I had a whole apartment to myself. decent wifi and a balcony. The flat was around 10 minutes from the Liverpool One and plenty of places to eat along the route. I'm not sure if it is because I'm an only child but I don't like sharing rooms or waiting for people. This might sound selfish but I like my own space and I get anxious about being late, even if something doesn't have a specific start time (or rather you don't need to be somewhere for a specific time) I'm also one of those early people. You know the ones. If I'm less than 10 minutes early I feel late. The apartment meant I could work on blog posts (haha) but I did manage to edit a few videos for my YT channel and I didn't feel cooped up like hotel rooms. Yes, it would have been nice to spend more time with friends but I like my solitude. This also is why I turned down all the offers from people to meet them before the event and walk in with them. Sorry if I looked rude or ungrateful but sometimes I just need to get myself there and in. The event itself was huge and there was a lot of brands but while I did walk around a lot, I also feel like I didn't see anything. A lot of the upcoming fashions really don't feel like something I would wear or are wildly out of my price range, even if they were half price. That's not to say I didn't seem some nice things. I'm sure I did, I just don't remember! I got to see a lot of my favourite people, I had more hugs in that one day than I've had all year and that really means a lot to me that people are so friendly and while most of the year they live inside my phone when we meet up it's never awkward and as if we only saw each other a few days ago. I did still have to have a couple of breathers by myself as I always do. This event is huge and it's open to all, not just brands and bloggers which I think makes it special. There are also some celeb who go and you can meet and have books signed but I'm not about that, one I don't know who half of them are or what they do! I recognised Gemma Collins and Tess Holiday barged past me knocking me into a stand (ouch) but that was my only interaction. If people like that thing then you have meet and greet opportunities but other than a selfie with Sandy from Google box I didn't have any interaction with the celebs. One mistake I made was to forget my bank card, luckily it was back at the Air BnB. I think I told everyone I'd lost it, but I didn't panic or immediately leave. I just droned on about it. I did end up leaving early just to make sure it was where I thought it was. I did buy a dress from Apples and Pears clothing and was tempted to buy something from New Look (which is how I discovered my card was missing) From all the stands I think New Look is the most me which is odd as I rarely go into a New Look store as there seem to be less and less of them with the plus size range in store and I don't do a lot of online shopping for clothes. Over the past couple of years, the organisers of The Curve Fashion Festival have listened. Last year there were issues with places to sit and chill out, this year there was a lot more seating available. Still not enough but far better than ever before. Last year the temperature was ridiculous and a lot of people complained and I know of at least 2 people who left early because they felt unwell. This year it was moved to a different hall which we'd been told there was air con. For me, it was still far too warm. I do think the aircon was on but it's such a big space and for the number of people it just doesn't get cool enough. I made sure I wore a short sleeve top and light pants. I don't know how they could improve this but I did remember to take my fan and I got use out of it. The VIP area also seemed better but I'd only bought a standard ticket as last years VIP looked quite poor. I'm not sure I'd buy a VIP ticket next time but it was good to see feedback had been taken onboard. Other improvements which might be out of the organisers hands is the price of food and drink. It was over £2 for a soft drink and I think bottled water was around the same price. £7 for a small chicken burger and sweet potato chips. It would have been nice to get some cold water for a reasonable price without having to leave the venue. I did have a lot of fun, I remembered to take selfies with people but I didn't use any of the photo booths which is a shame as we all know I love a good photo booth but my mission was to do selfies and I did!! They are on my Instagram account if you want to see them. As I've said I love the city of Liverpool and it's really easy to get around, I walked everywhere but there is lots of public transport and taxies. I'm really proud of myself for walking and I got to see a lot of the city. If I'd not forgotten that blasted card I would have liked to have wandered around Albert Dock and I had planned to explore Liverpool One again but by the time I got back to the apartment, located the card, wandered back to Primark to get some bits I was shattered and went back, got a cheeky Burrito and put my feet up for the night. I would highly recommend going to an event like this, it's well organised and it's good to catch up with people, nice to to some shopping and good to visit a city I love. If you’ve been following me since the start of the year you will already know that I’ve set myself goals rather than resolutions this year. As the months go on I’m going to be amending and tweaking things as they still don’t feel perfect but I’ve split my goals into 4 areas Blog, YouTube, Social Media, and Life. I’m also having one blog or social media focus point each month. I do feel like I’ve fallen out of love with blogging but every time I think about stopping I get renewed energy again. I like that I am only blogging when and what I want. § Engagement – Nope, I’m still pretty bad at this, oh well. § Replying to Comments – Yes and no. If I’m about when a comment comes in I try and reply there and then but I worry about being too eager. I do periodically go back over comments and reply, but then I worry it’s too late. How my mind works!! § Build my audience – I had a 2% growth in my following which is great but again I’m not checking analytics. I’m bumbling along. Again, it’s very much a hobby. The other night I checked my approx. revenue and it's $5 for the last year! I’m not looking to get rich! § Reduction in posting – Maybe – I’m back to posting 3 times a week. I had a blip in July where I just didn’t want to film anything but I’ve got my mojo back. I’ve started filming makeup free. I hate it when I look back on it but to be honest I’m makeup free most of the time so it’s a true reflection of me. § Growth – As I think I said in last month’s post, I wanted to stop focusing on social media growth and concentrate on blogging, well my love of social media won out. Small growth and only one drop but I’m not too worried about that. I’m also almost there will all my targets. I still haven’t made my mind up about Bloglovin, Is it still the bad fairy? Wicked Witch of the blogging world? I’m just leaving it to do its own thing with the odd tweet of promotion. Pinterest, I’m a little bored of, I’m sure I’ve read the number of followers don’t count for anything on it and I can’t remember the last time I pinned anything. Instagram, well what can we say. The algorithm has screwed most of us over. I know since I took the end of month stats I’ve lost a lot of followers, but I know I will gradually recoup the loss only to lose them again. It seems like for every follower I gain I lose 3. I’ve given up on checking follower apps. What will be, will be? I’ve also noticed one bloke keeps following then unfollowing and then refollowing from a slightly different name. He isn’t commenting or doing anything so I’ve not blocked but do they not realise we notice these things. I've also got a little geeky and made myself a graph! Google Plus – Other than scheduled messages I haven’t really bothered with it. I want to try and use it but I’m not sure it’s worth the time or effort. § Go back to the gym – No, no and no again. I had been going to Zumba but I hurt my ankle then I’ve been having a time of the month for 3+ weeks and I really CBA with it. Maybe in October! § New Job – I’d settled for a while but this is getting more real. I need to start looking and applying. I did apply for one job but I got a rejection email. I don’t know what I want to do. However, I might be in line to get a qualification through work. I’ve had to enter a competition to win one of 9 places on the course. I hate competition and my entry was crap and took less than 15 mins to do. § Read more – I am reading more but I keep re-reading the handmaids' tale! I’ve read it 3 times since June. I’m currently reading The Little Teashop of Lost and Found by Trish Ashley. I’m around 200 pages in and enjoying it so far. It’s a light-hearted read. YouTube – Tuesday, Thursdays, and Sundays for the time being. Lifestyle | My Love of the Theatre - mini reviews and memories. I know some people who seem to go to productions every few weeks and I haven’t been that fortunate but I wanted to document some of the more memorable productions I’ve seen in recent years. I’m sure I have forgotten some of the performances as I started to type I did remember another production I’d been to see so there must be others. My one and only trip to the Lowry Theatre in Salford was to see “Dreamboats and petticoats”. In truth, I didn’t really enjoy this. We had bought tickets for my Grans 80th Birthday and she loved it. The saving grace was how comfy the seats are at the Lowry and I’ve been meaning to go back ever since but it’s not somewhere I remember to look when I’m checking what’s on guides. My favourite theatre in Manchester, I much prefer it over the Palace theatre and I can’t really justify my reasons for that. Maybe I’ve preferred the productions I’ve watched at the Opera House more or it has a nicer atmosphere. But from the two I will try and book there over the Palace. Evita – I have been Evita obsessed since the film came out. I share a birthday with Eva Peron and well Antonio can be my Ché any day of the week. Sadly Madonna and Our Tony weren’t in this production but it was really well done. I love every second of it and wish want to see it again. It was recently on at the Lowry but I didn’t get tickets as I had no one go with. We Will Rock You - I laughed, I cried. This has to be the best thing I’ve ever watched in a theatre and would love to see it again if it was ever on again. Curly Watts from Corrie was in it and while I didn’t know what to expect. I hadn’t read anything about it before we went I was hooked from the opening scene. The Full Monty - I watched this on a girl’s night out from work and it was a lot of fun. I felt it was pretty true to the movie and stared quite a lot of familiar faces. Mick from Brookside. Gary Lucy and I would recommend seeing this. I adore the film and I could watch the film or see the production once a week and not get bored. Singing in the Rain – Can I describe everything as magical? This one was my choice. I got to pick as my mum really wanted to see Guys and Dolls (more about that later) and I didn’t so we compromised and watched one each of our choice. Spoiler alert, I won in which was the better production. Mine had real falling “rain”. It had good songs and actors who could really sing. I didn’t want to leave. Encore!!! While I don’t love The Palace Theatre, I have been a few times and if you get a seat in the stalls it’s much better than the circle in my opinion. I think We’ve been the victim of bad seats and drunken people which has really put me off going back. Phantom of the Opera – This was my first Phantom experience and I love it. I might be one of the few people who seemed to shy away from Phantom and it was never a must-see production. I tried to watch the film with Jennifer Ellison in when it came out but never managed to watch more than about 30 mins before falling asleep. I think this says more about me than the movie. My only issue was, I had a bad back and the seats were so, unfortunately, I ended up standing by the loos for a good portion of this production. I feel like I do need to see this again and I missed the chandelier as I was in the loo’s crying in pain! Despite this, I would go back and hope my back held up. Dirty Dancing – I have watched the movie a million times and I probably know it word for word. When we got tickets I was really excited but sadly it didn’t live up to expectations. The accents were awful, veering from bad Elvis impressions to the broadest Mancunian I’ve ever heard! It was a lot of fun and we had a bit of excitement when near the end with the Iconic Johnny running to baby a Woman jumped up as he didn’t run down the aisle near her and she was almost clambering over people to try and get to him!!! Sadly due to her being up and shouting, we didn’t get to see this part of the play but it was very funny. We also had an elderly couple in front of us. The husband clearly didn’t want to be there but once he woke up (yep he was snoring along with the first half) he was tapping his feet. Would I go back and watch it again? Probably not. If it was with a big group of people then maybe but overall I’d rather watch the film on TV. Guys & Dolls- - For me this is the worst production I’ve watched. I didn’t enjoy it one bit and we even left in the interval. The accents were almost offensive they were so bad. The singing was terrible. I’ve tried to find a nicer word but that is the only one that will work. The seats we had were awful and uncomfortable added to the fact we were in a row full of drunk people with bladder issues so I spent more time out of my seat as between the 4 of them they went to the loo 2-3 times each in the first half. While this did ruin the enjoyment, the overall production wasn’t good and I still think we would have left. What made me laugh was usually you get a text or email as the production finishes to do a survey and that didn’t happen with this one. Did they know I was going to slate it! Someone I work with watched it on a different date and really enjoyed it. My local theatre and my favourite. It may only be small but I’ve enjoyed every production. The seats are comfy and touch wood we’ve had good seats. We always sit in the circle and it has such a good atmosphere. Brassed Off (watched twice it was so good!) - Where I live we have a Brass band contest each year on Whit Friday, part of my town used to be Yorkshire and they are fighting to become Yorkshire again (they might already be in it) Brassed Off speaks to me. I also spent a bit of time in Sheffield as a teenager (Don’t ask, some things are better left unsaid) When Brassed off was announced we booked tickets right away. The Band part was also real local brass bands. We when watched it the first time we loved it and knew my gran would love it so we booked again for when my Villages brass band were playing. What I loved and it's such a small detail. In the film the Grimly collar colours are purple and gold, the first time I watch it looked like they were wearing the uniform, when we went to see it again, we realised that the cast was wearing the uniform matching of the local band. This was obviously cost-saving rather than kitting out a whole band but I feel like this supported the local band as that is their identity and makes them recognisable at band events. The Lady Killers - I had no idea what this was about, my mum booked the tickets and it was fantastic. The stage is so small but the set was is well done and it worked perfectly. Ghost - I may be one of the few people who has never watched the film. I know the premise and I've watched a bit of it but when it came to our local theatre my mum really wanted to go and it was an excellent production. 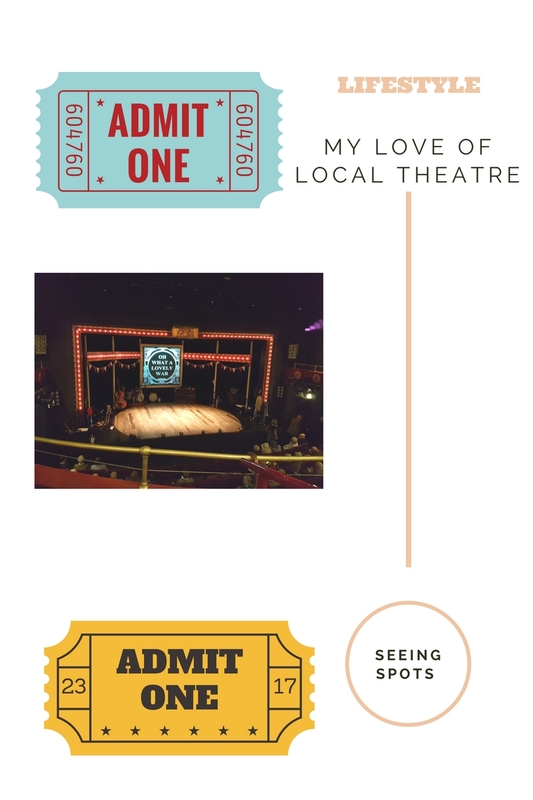 It was put on by a local amateur dramatics society and I'd say it was as professional than any of the productions we have watched in Manchester. We have booked three more shows at our local theatre. Oh What a Lovely War - Again, I am going in blind. I have no background at all on this at all. I will have to report back once we've been to see it. Sing-a-long Sound of Music - Who doesn't love the sound of music? While this isn't a show it is going to be a lot of fun and I feel like I will be watching the audience more than the film itself. Sister Act - One of my favourites. Well, I prefer Sister Act 2 but I wanted to go to see it in Manchester but the dates didn't work for us. I believe this is the same Amateur company that did Ghost and that makes me even more excited. I'm a huge fan of facemasks and I try and do one one a week or so. Some weeks I'm better than others. I'd noticed my local Primark had a mix of new and interesting looking face masks in. In recent times, I've noticed I prefer sheet masks over mud type mask (wash off or peel off masks) I still love them but I do have a huge stock of sheet masks already and I've recently finished all three of my L'Oreal mud mask pots (they are really nice btw!). I will hold my hand up and say the packaging drew me in. Initially, I hesitated at the price of a lot of the masks. At £3 each they seemed expensive compared to the ones I've been getting from boots and superdrug but I haven't had a bad word to say about any Primark branded skin care. I also picked up a couple of other products including a mud mask as they used to be a favorite and I have finished my L'Oreal masks. My sleep has been all over the place recently so I'm hoping the sunflower and cucumber eye mask ones will make me look more human. I only picked up two of the Holler and Glow masks as I did decide to be sensible and test them before I did my usual and stock up. To my surprise (I didn't read the packaging - It might say) The masks are patterned as well. I was hoping they would be but I'd convinced myself it was just going to be pretty packaging. The shape of the mask was a little more oval than other masks I've used, but this worked well and fitted my face better than expected. After using the mask for 15 mins, the mask had dried up quite a bit but my skin felt amazing and soft and I was lovely and relaxed. At £3 I do think these are on the expensive side, however, I do think I will be buying some more of these. My immediate thought was these would be fab for a girlie sleepover or hen weekend, there is a lot of different masks and there should be one to suit everyone and think of the selfies! I have just realised it is September! I'm sure I say this every month but where is this year going? I'm back making Month in Minute videos. The idea is to record 2 seconds a day and at the end of each month, you will be left with 60 seconds of your month to be edited together and dah dah! 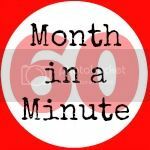 Month in a Minute. I got the idea from Sian at Helpful Mum and she has a linky you can join if you make these kinds of videos as well. I'll be honest and say I don't record every day. I've started recording about 5 seconds at a time and I usually end up with about 3 mins of footage that I edit down to a minute. My Monday to Friday's are the same. Tram, work, sleep. It has the odd variation of a possible gym trip and a Slimming World class. Weekends are also quite stagnant with weeks being made up of shopping and brews. I did do a few fun things in August but I was having so much fun I forgot to film them! My fun things include an Event at Bella Italia and a Greek Meal with a friend. I've also blogged a little bit more than recently and got my YouTube mojo back. Septemeber is set to be a lot of fun, I have a hair appointment and a meal out tomorrow. Next weekend is The Curve Fashion Festival in Liverpool. If you're going make sure you say hello! I get a little socially awkward, I'm doing my best to stay calm. Including staying over Friday and Saturday nights so I can chill out and this might be sad but the thing I'm looking forward to is having a bath! I made sure I booked an Air B&B with a bath!!! Other fun things include a works night out (TBC) and planning a holiday to Mexico for next year. We're thinking Early May. If you have any recommendations let me know!